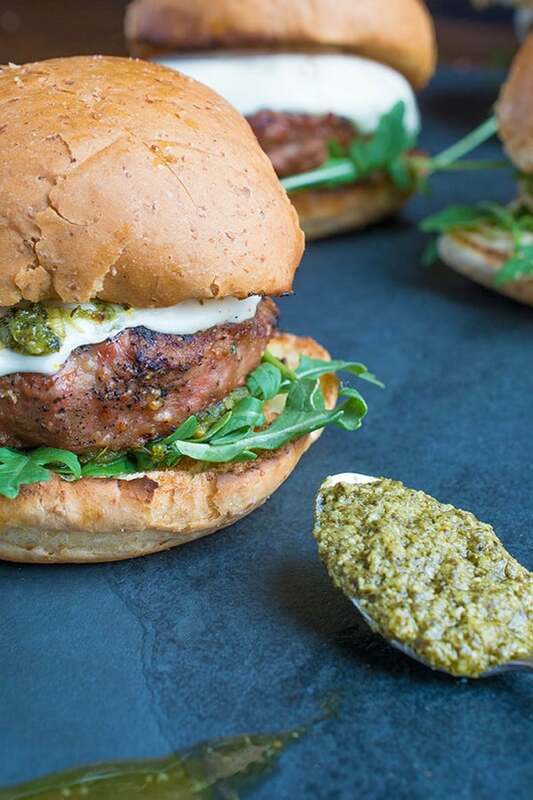 These juicy grilled pesto turkey burgers are topped with fresh pesto, spicy arugula and creamy mozzarella cheese. One reason I love living in the midwest is that we don’t take warm weather for granted. The minute the snow melts and the temperatures remain above 50 or 60, we are outdoors morning, noon and night. When it comes to meal time, that means we are using our grill as much as possible. Not only is grilling a naturally healthier way to prepare foods but it always results in a more complex, flavorful dish. 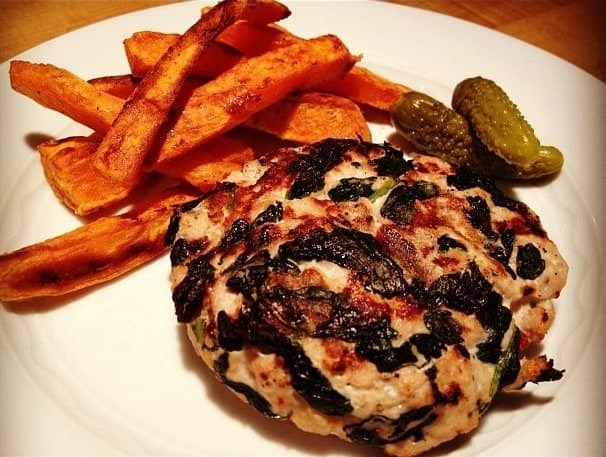 My husband loves turkey burgers (no really – it’s probably his favorite dish of any that I make for him!) so I am always coming up with new ways to re-invent the classic. 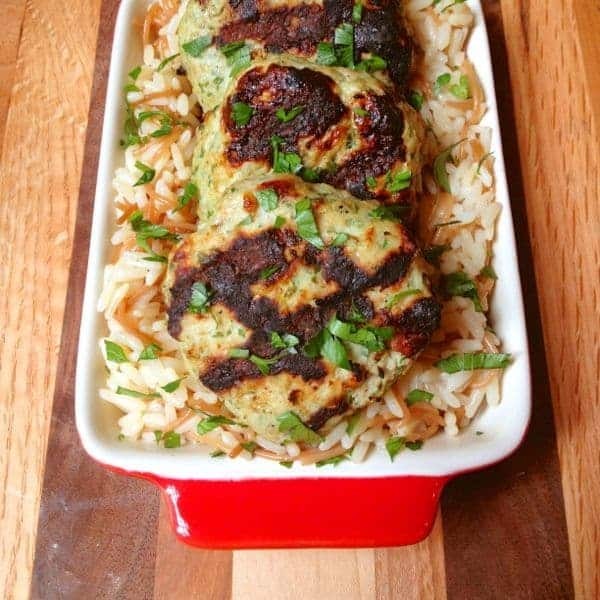 With a last name like Della Croce, I really can’t go wrong giving any dish an Italian spin so I decided to do just that with these grilled turkey burgers. 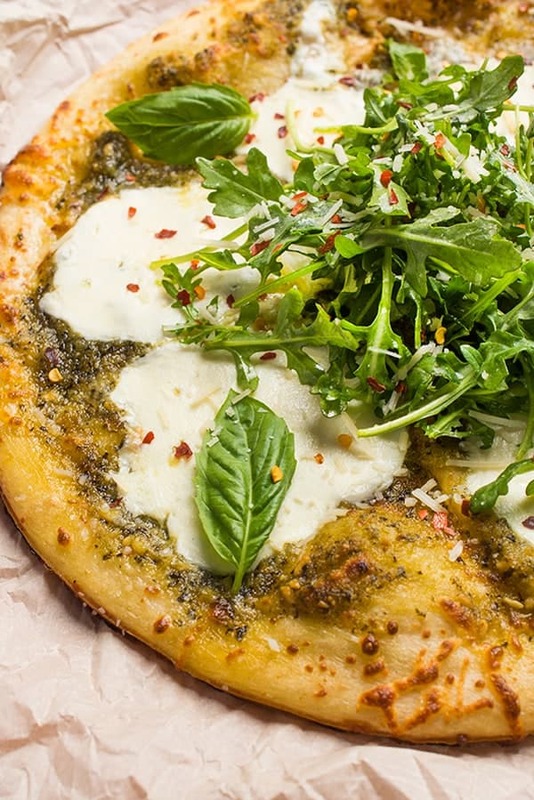 Topped with bright pesto, spicy arugula and fresh mozzarella, each bite is a flavor explosion. To keep the lean turkey meat juicy while cooking, each burger is filled with sun-dried tomatoes and parmesan cheese. Of course there are a few garlic cloves in there for good measure. What sort of wife would I be if I left out the garlic? 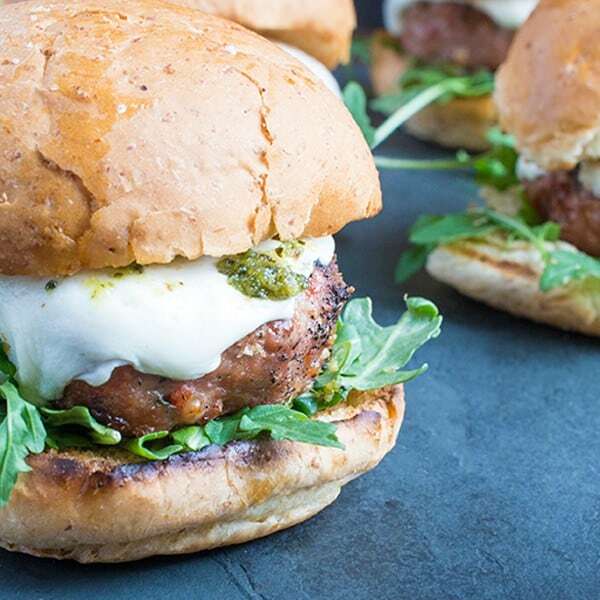 These mouth-watering grilled turkey burgers are topped with fresh pesto, spicy arugula and creamy mozzarella cheese. Pre-heat grill to high heat. In a medium bowl, mix together ground turkey, sun-dried tomatoes, parmesan cheese, grated garlic, salt and pepper using your hands. Form into four equal-sized patties. Grill turkey burger patties over high-heat until cooked through, about 3-4 minutes per side. 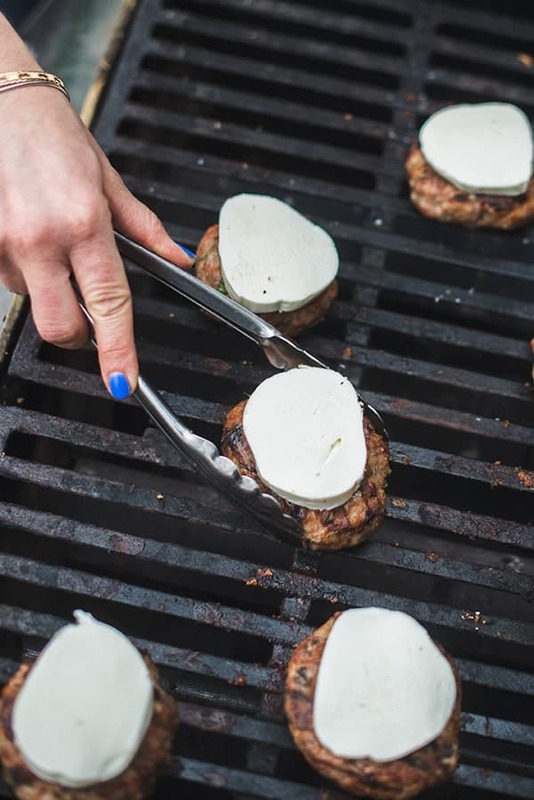 During the last minute of cooking, top each burger with one mozzarella slice and heat until slightly melted and bubbly. 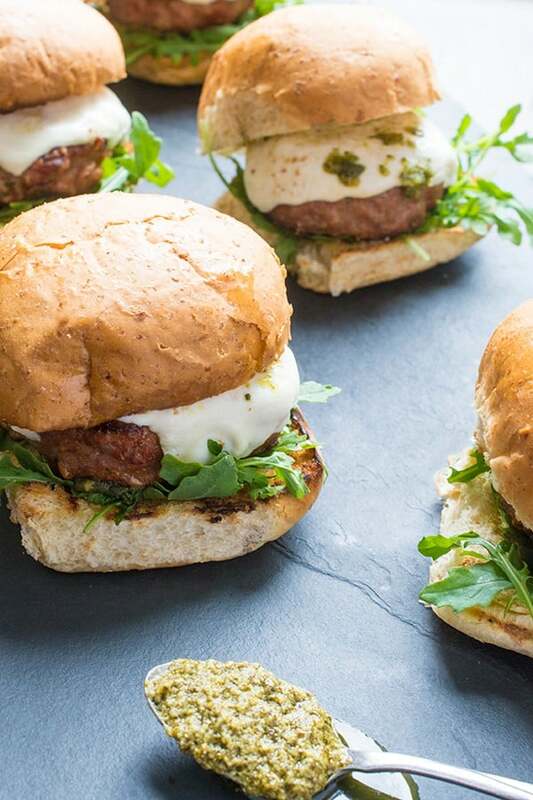 Place burgers on split buns and top with pesto and arugula to serve. Disclosure: I am honored to be an ambassador for Kroger. Thank you for supporting the brands that make The Lemon Bowl possible. All thoughts are my own. Even more Grilling Recipes are waiting for you on Pinterest! This was AMAZING! Sooo good! Tastes like something you’d pay $15 for at a restaurant. It’s an easy recipe to meal prep as well. Hello Liz, I made this burger as per your instruction. Its taste was awesome. I’m so happy to hear that Brady! These burgers were so great! I added italian seasoning to the burgers and left out the sun dried tomatoes. I love them but my husband doesn’t. These were so delicious, I may add bruschetta to the burgers next time. I used pesto and a little balsamic mayo on the buns. Great recipe! So yummy! Wow I love that changes you made! So glad you loved them! My family loved these! Even my picky 7-year-old devoured hers AND wanted seconds. The only changes I made was using grated Parmesan instead of shredded (because that’s what I had on hand) and I cooked them in a cast iron grill pan. We live in an apartment that doesn’t allow grills, so I had to compromise. Thank you for a healthy alternative that was super easy and wonderfully delicious. Oh I’m so thrilled they were a hit! Let me know if you try any of my other recipes!! These were delicious! Wow! I wasn’t expecting them to be so good! The flavor of the burger was really good–very moist and flavorful. I loved the sundried tomatoes; I could taste that really well. Every aspect of the burger was complimented really well. I’ll definitely make these again. Well done! Thanks for the recipe! These were very yummy thanks for the recipe!!! I put sum Chile Serrano and it got spicey ❤???? Oh I’m so glad you like them Amelie!!! We made these burgers for dinner last night and they are delicious! My husband and I devoured them. Thanks for sharing! So glad to hear it Colby!! Let me know if you try any other recipes! Thank you so much – they were amazing! I’m with you, if we can get a good semi-warm day around here, I’m out there grilling! 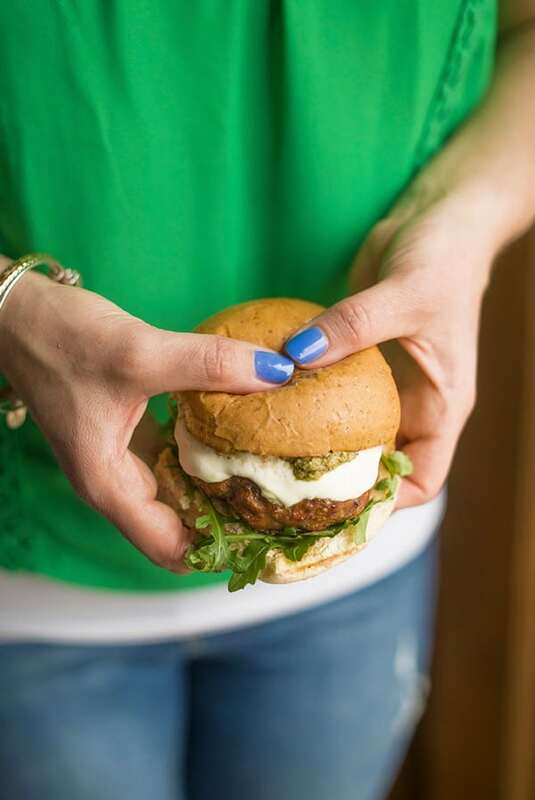 You can’t go wrong with turkey burgers, every loves them. But this recipe takes turkey burgers to a whole new level. I love that you used arugula, it is my favorite! Isn’t grilling season truly the best? Hope you had a great Mother’s Day Tanya! Growing up in the midwest I 100% agree with you! When it hit 60 I was opening up my windows and headed outside like it was 100 degrees…haha. 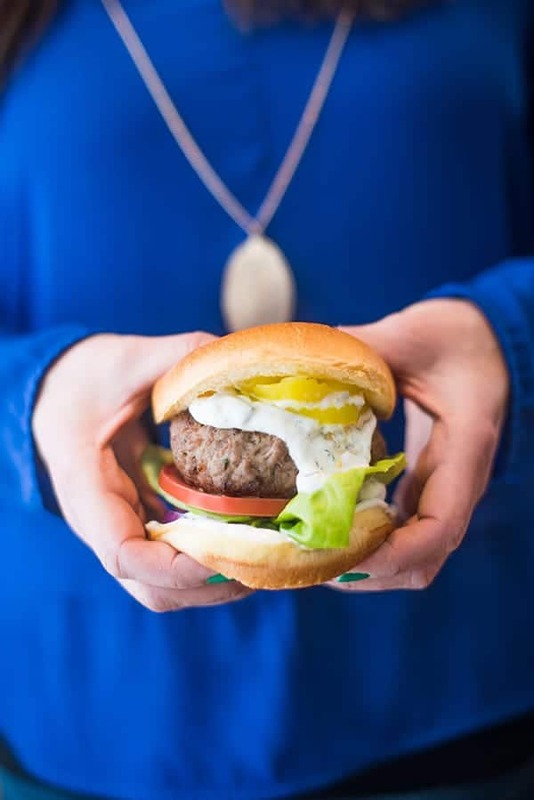 After a cold winter you look forward to 60 degree days :) I also always look forward to grilling season and these burgers are PERFECT for a quick weeknight (or fun friend bbq!) meal. It is so funny how that happens!! Today it was like 55 and i have a dress on lol. Love a new spin on a burger. Looks fabulous, Liz. Happy that grilling season is here! Me too Sandy!! Cheers to grilling! There’s nothing quite better than a big juicy burger cooked on the grill! These look great! I am so happy grilling season is here!!!! And I know you are too! 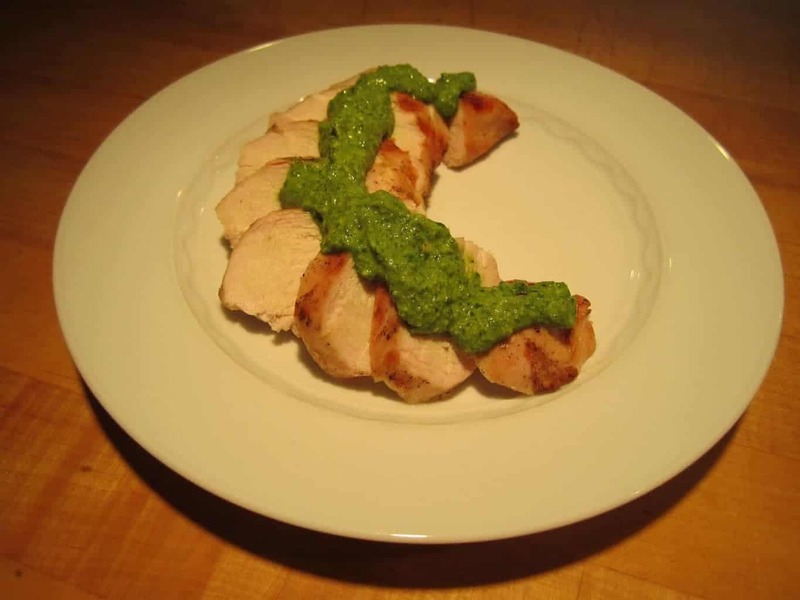 These would be even better if you mix a little pesto in with the meat before grilling… sounds super yummy! They definitely would!! Great idea!